Updates, Utilities, Files, and More! Download the latest manual in PDF format. Elegant parallel port interfaces by W1WEF. Get the trial version of TR LOG for FREE! Top contesters rave about TR LOG. Frequent updates and fast response! TR LOG has a new website address: http://www.trlog.com/! 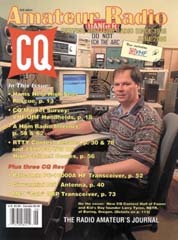 Check out the June, 2000 issue of CQ magazine! Larry "Tree" Tyree N6TR, author of TR LOG contest logging software, is featured on the magazine cover. Congratulations to Tree, a member of the prestigious CQ Contest Hall of Fame, and the 2003 Hamvention Amateur of the Year!. TR LOG is a high-performance Amateur Radio contest logging program designed to make the most of your computer during a contest. It is designed so that the process of making and logging contacts is as efficient as possible - so you make more contacts.